The memorial is now badly damaged from a series of automobile accidents. It was originally topped with a granite eagle, now lost. As of 2018, the top half of the memorial, which listed the wars, is also missing. 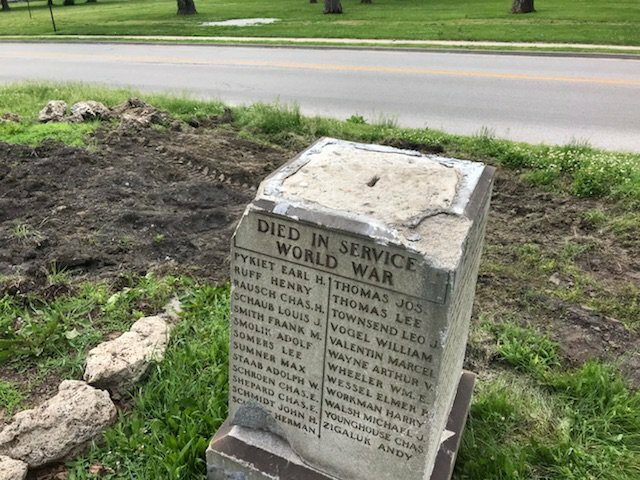 East St Louis American Legion Post 2505 and community leaders hope to rebuild the memorial and relocate it to Jones Historic Park. Place cursor over image and scroll to zoom and pan. For mobile devices, pinch to zoom and pan. A 17-foot-tall shaft of Barre granite, the East St. Louis Soldiers Memorial honors veterans of World War I and three earlier wars (Revolutionary, Civil, and Spanish-American). Each war is listed on one side of the shaft's upper portion. The lower portion of the shaft is inscribed with the names of 103 East St. Louis men who died in the World War. 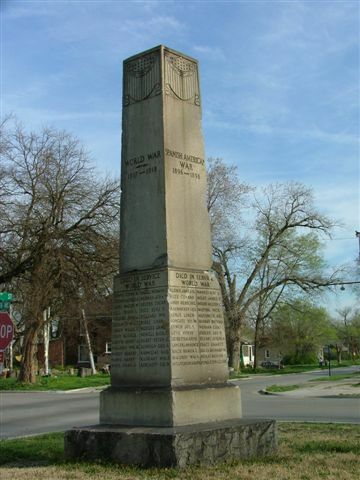 It was dedicated on November 11, 1924.
intersection of Lynch, N. 25th, and N. 26th Sts. Login or Register to rate items, add comments, and save favorites.